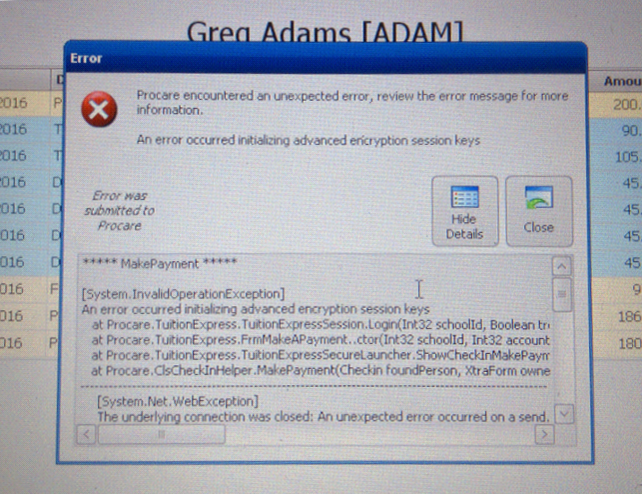 This error may occur when attempted to process payments through Tuition Express: “An error occurred initializing advanced encryption session keys”. An older version of Procare (below 10.3) that doesn’t support the latest security requirements of the Payment Card Industry (PCI). Your computers must be compatible with (and have updates installed for) Procare 10.3, in order to use Tuition Express. You must check the compatibility of your computers and update to Procare 10.3. For step-by-step instructions, see: Tuition Express: Critical Security Update! Tuition Express: Critical Security Update!